Next PostOLGA Surge Volume Bug? Very detailed and informative analysis. Thanks for doing this. 1) When you say older versions of OLGA (5 and older) have no benefits of multi-core processing, you mean that they use only single – core? So all that matters for OLGA (5 and older) is writing speed I/O and clock time? 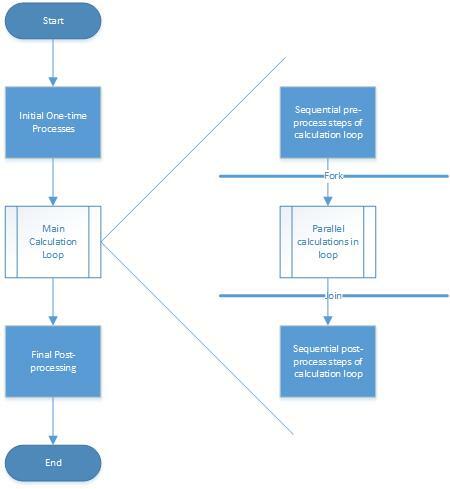 2)When you set OMP_NUM_THREADS environment variable to 4 in order to run OLGA at an optimum parallel efficiency then even if you run 2 independent simulations in parallel will the core use be still limited to 4, even if the machine is 8 core processor? When you say older versions of OLGA (5 and older) have no benefits of multi-core processing, you mean that they use only single – core? So all that matters for OLGA (5 and older) is writing speed I/O and clock time? Yes all versions of OLGA prior to OLGA 6 are single threaded. So yes the major factors are clock speed of CPU and the I/O speed. When you set OMP_NUM_THREADS environment variable to 4 in order to run OLGA at an optimum parallel efficiency then even if you run 2 independent simulations in parallel will the core use be still limited to 4, even if the machine is 8 core processor? 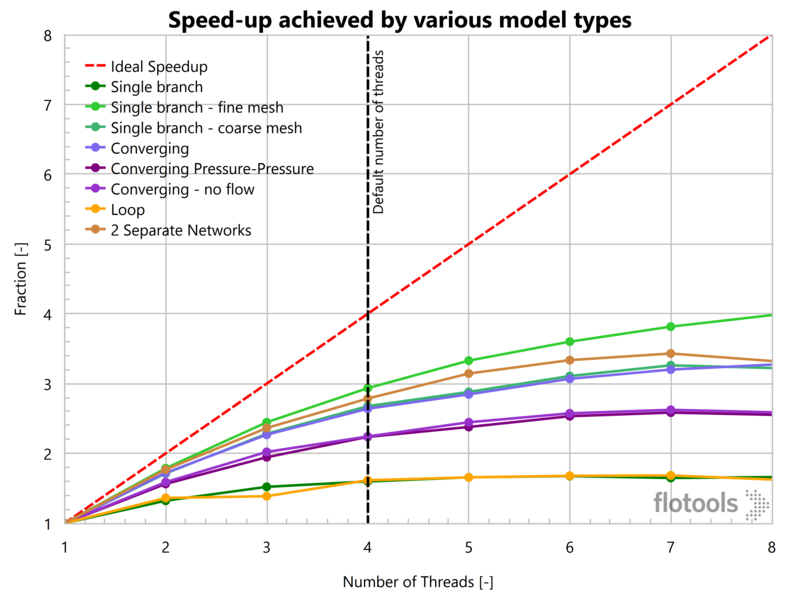 Each of the simulations will use the number of threads specified in OMP_NUM_THREADS. So if you started two simulations you would be utilizing 8 threads. For an 8 core hyper-threaded CPU, you can run up to 4 simulations (each utilizing 4 threads for a total of 16 threads). 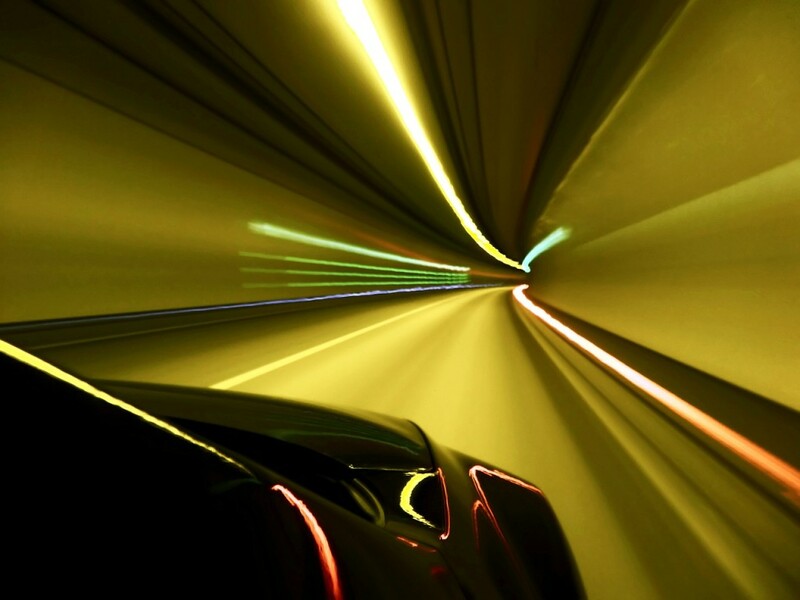 Please bear in mind if you run too many simulations on the same machine I/O speed can easily become the bottleneck. 1. I feel that these results might be a bit hardware dependant. It looks to me like you used a 4 core processor with Hyper-threading which is a feature of some of the high end Intel processors. From what I understand this assigns two virtual (or logical) cores to each physical core of the processor (giving 8 virtual cores). The idea behind this is to increase the utilisation of each core, as there are two logical processors, with one using the processor resources whilst the other is stalled. Essentially this makes more efficient use of the processor resources, as it allows a second thread to be run in any ‘downtime’ in the first thread. The end result of this is that you should expect diminishing returns when increasing the number of threads beyond the number of physical cores of your CPU. 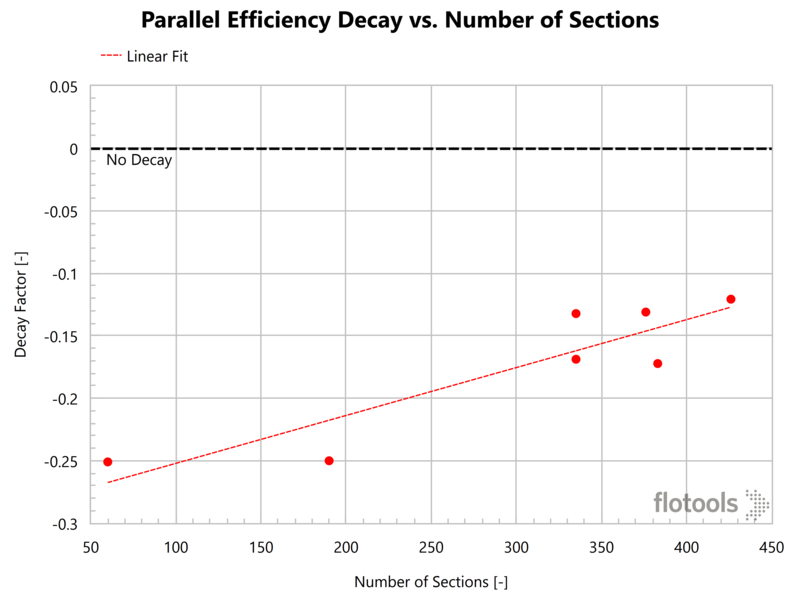 That’s why I don’t think it’s a coincidence that you found 4 cores to be the optimum in efficiency! As you’ve shown, the nature of the software is such that it doesn’t scale perfectly with the number of threads used. However, assuming we had a program that did scale perfectly on the software side, you should still expect to see worse performance scaling beyond 4 threads, as a situation would then arise in which each physical core would start sharing resources between 2 threads. 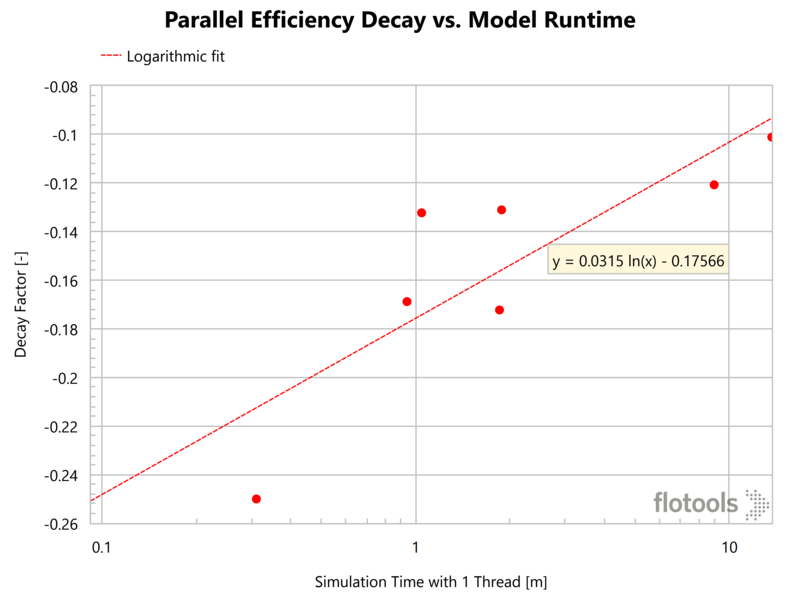 a) don’t expect to get the same performance when running two simultaneous simulations with 4 threads. b) if running an older version of OLGA which doesn’t use multi-threading, disable hyper-threading on the PC if you can. 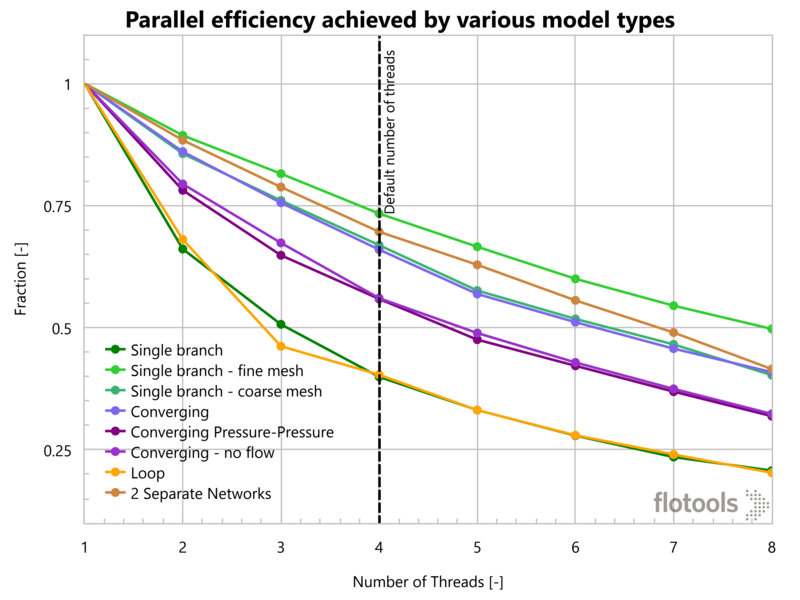 I feel some additional analysis with a different processor would give better insight into whether 4 threads is actually the optimum when it comes to OLGA’s performance scaling with multi-threading. There are Intel processors available with 6 or 8 physical cores (12 or 16 logical cores respectively with hyper-threading), so I would be interested to see if the ‘sweet spot’ is actually at the number of physical cores available. Although 4 threads on your machine appears to be a ‘sweet spot’, there’s still absolute gains in performance at higher numbers of threads. Therefore it would be better to have a dedicated PC for each licence you have and use the maximum number of threads available (or maybe a couple less given that some of your results showed no improvement going from 7 to 8 threads) – considering the high cost of software licences, hardware is relatively cheap and it makes sense to use each licence as efficiently as possible. Try a RAM Disk – Google that one (that might be a bit extreme though). James, thanks for your comment. We did have the same questions that you pose in your first comment when we did the study. So we are planning to extend the study to machines with 8 and 16 physical cores. I have mixed feelings about comment #2 and #3. While theoretically what you are saying makes sense, in a practical setting there are some other considerations. Typically your IT department wants to reduce and consolidate the resources they are managing. If you have 8 licenses, they don’t want to 8 machines that they have to worry about failures, software updates, security patches, etc. Another possible direction, which at least a couple of our customers are exploring, is moving compute instances to the cloud (like AWS EC2) and there the choice of hardware makes a big difference in your monthly costs. All said, I do appreciate you reading the article and thinking deeply about the issue. We hope to follow up with some more information on this subject in the coming weeks and months.